Android is an OS on the up right now, and as usual, gaming is leading the way. 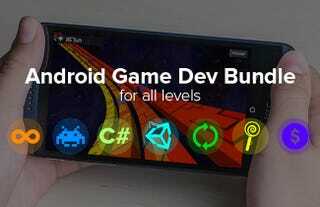 If you want to get involved, this bundle of courses should get you up and running in game development, at 93% off the regular price. The thing I like about this bundle is that it starts at no-idea level, and gives you the skills to head in the direction you want. For a little more input, you can also learn with the Beginner Game Reskinning Course, and you get two courses on general purpose Android development. Equally, if you want to get into the nitty gritty of C# and Unity — the staples of building a game from scratch — there are three courses dedicated to that, too. In total, it is 68 hours and $761 worth of content for $49. We can't offer refunds, but all the courses come with unlimited lifetime access on Udemy. See the link for all the details.